Sydney Stanford swimming at a meet. 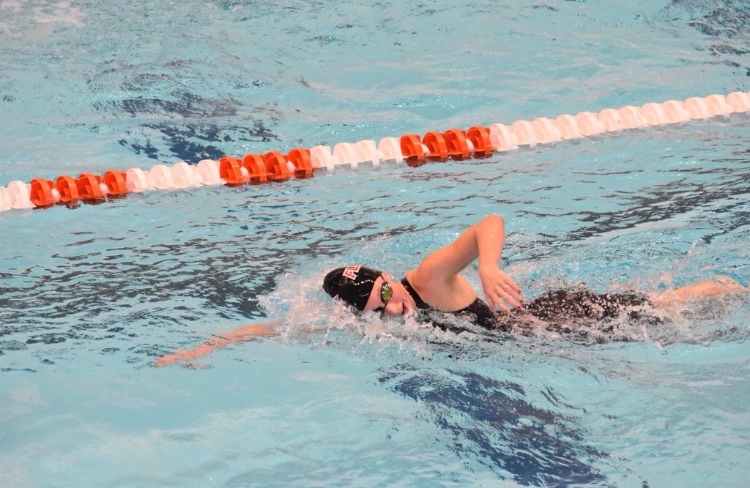 Just two weeks ago, the Cy Woods swimming team dominated the competition and showed off their greatest strengths at the district’s latest swim meet. Their combined efforts and 212 spirit in the pool were well rewarded with first place. Every single swimmer put in everything they had; however, there was one who gave it her all and added an extra ten percent to ensure the win. Junior swimmer Sydney Stanford was the one to receive Swimmer of the Meet after the stunning performance that put Cy Woods at the top as district champion for the second year in a row. Swimmer of the Meet is by no means an easy feat to achieve, and is notably only earned through hard work and dedication. Along with sheer effort and labor, Stanford also has years of experience to back up her talent. However, Stanford has no plans to slow down just because the Cy Woods team is on top. She’s still hard at work and looking to make her accomplishments known nationwide. Even after her high school swimming career ends, Stanford will still have goals to reach, and she plans to keep on dominating the waters in bigger and better teams. When asked what she enjoyed most about swimming, her answer didn’t necessarily include the competition or the physical sport itself.